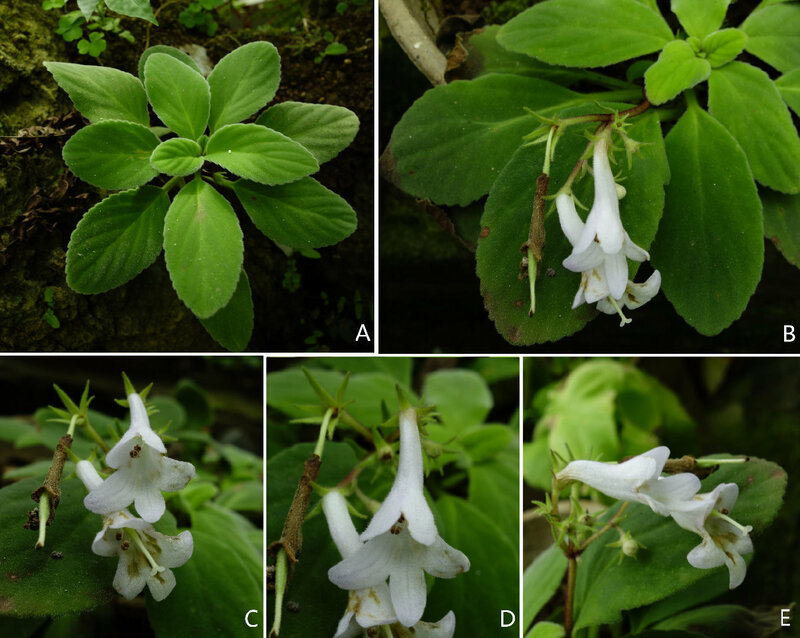 Petrocodon tongziensis R.B.Zhang & F.Wen, a new species from northern Guizhou province, China, is described and illustrated based on molecular and morphological evidence. 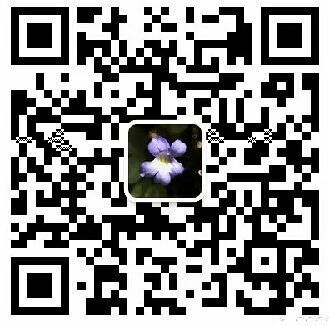 The new species was found growing in crevices and on tufa of moist surfaces of limestone hills in Tongzi County. 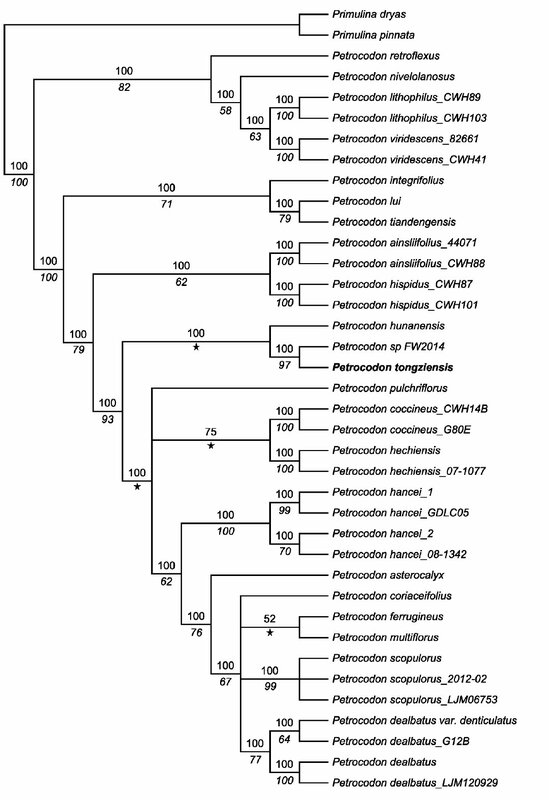 A maximum parsimony (MP) analysis based on the combined ITS and trnL-F DNA regions showed that the new species falls within a large polytomy within Petrocodon, but is resolved as most closely related to an unidentifed species (WF2014) and these two taxa are in turn resolved as sister to Petrocodon hunanensis X.L.Yu & Ming Li. This is congruent with the fact that both P. hunanensis and P. tongziensis have four fertile stamens, a character state likely to be an ancestral state distinguishing this clade from the rest of Petrocodon. Petrocodon tongziensis diﬀers from P. hunanensis by lacking a terrestrial stem, as well as by the number of bracts, presence of bracteoles, shape of the lobes of the upper lip, and reduced number and length of staminodes. Figure 1. Majority rule consensus tree based on 108 equally maximum parsimony trees, based on combined trnL-F and ITS sequence data. Numbers below branches in italics are boostraps values ≥ 50%, ‘★’ shows no supports. Newly described species in bold. Figure 2. Petrocodon tongziensis sp. 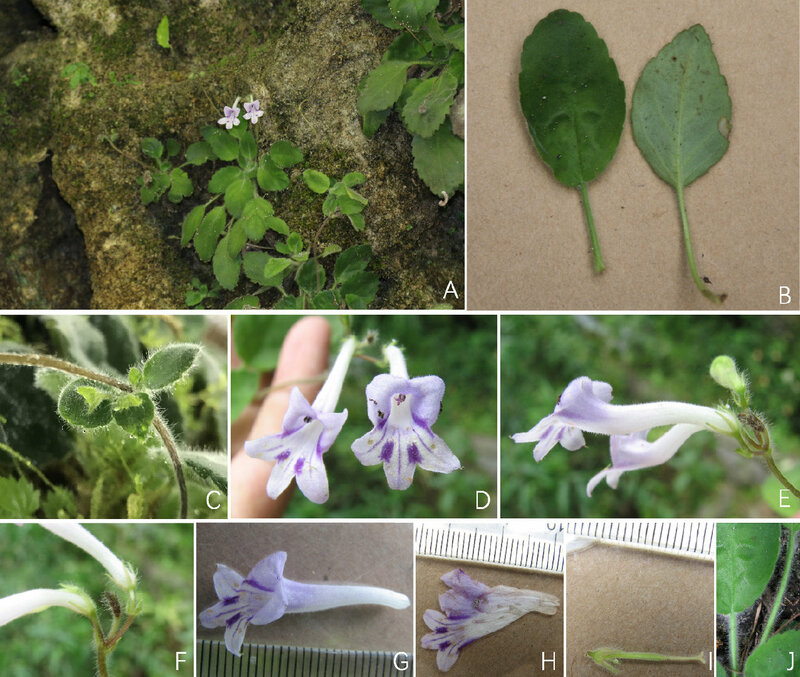 nov. (A) habit, (B) the abaxial surface of leaf blade, (C) the frontal view of corolla, (D) opened corolla for showing stamens, (E) pistil and calyx lobes, (F) capsule, (G) seed. Drawing from the type, Ren-Bo Zhang SBQ09383, by Tan Deng. Figure 3. Petrocodon tongziensis sp. 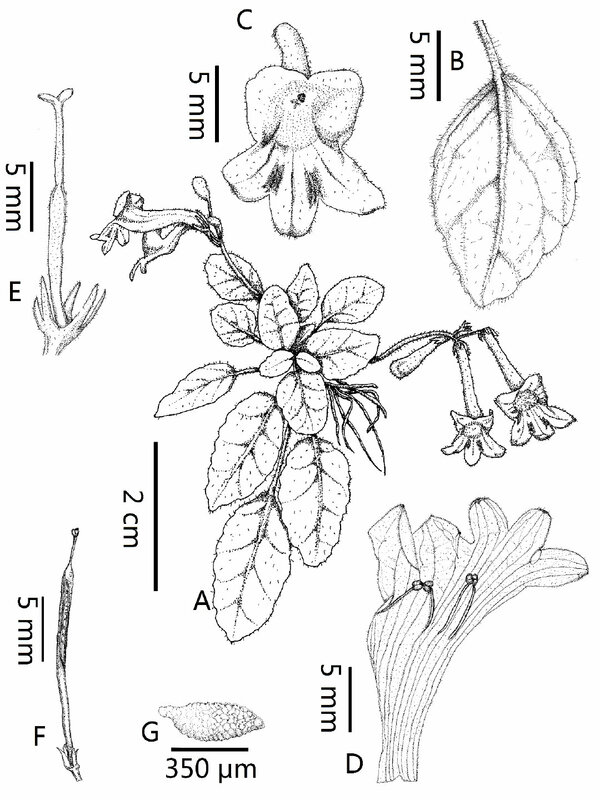 nov. (A) habit and plant in ﬂowering, (B) abaxial and adaxial surfaces of leaf blades and petiole, (C) bracts, (D) cyme and the frontal view of corolla, (E) the lateral view of corolla, (F) the calyx lobes and peduncle, (G) the lateral view of corolla and scale, (H) opened corolla, (I) pistil, (J) petiole and indumentum. Photo by Ren-Bo Zhang. Figure 4. The similar species of Petrocodon tongziensis, Pet. hunanensis. (A) habit, (B) cyme and young capsule, (C) the frontal view of corolla, (D) the top view of corolla, (E) the lateral view of corolla. Photo by Fang Wen.